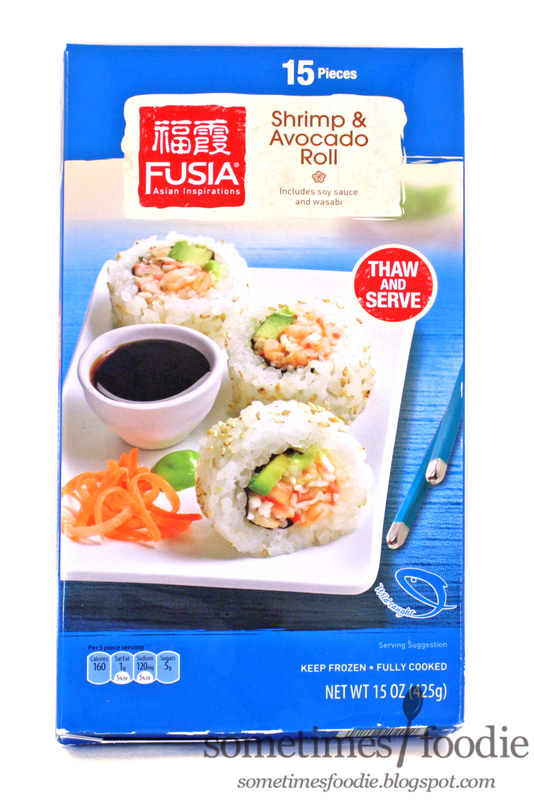 The frozen California rolls I reviewed last week were better than I expected, and I was able to eat all 15 pieces, so I figure I'd try the next flavor, Shrimp and Avocado. 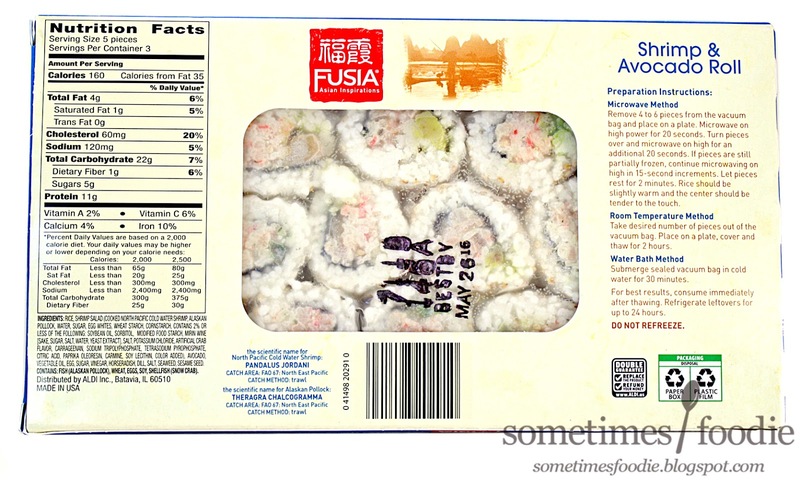 I already covered the packaging in my California roll review, so I'm going to go ahead and move right into the review portion. We have the same three thawing options, and since microwaving sushi still feels so...wrong, I decided to go with the 2-hour thawing method. When I opened the vacuum sealed plastic bag I noticed that the avocado on a few of the rolls had already begun to oxidize, so it was a slightly unappetizing brown color. I don't eat much frozen avocado, so I am guessing that's normal? (I hope.) I arranged the sushi onto a plate, covered it with another plate, and used my microwave as a cat-safe food-box. Two hours later I checked on the rolls and they seemed thawed and ready to eat. The avocado on some of the rolls had oxidized further, so I picked a few of the prettier ones for plating. Here they are. Little rolls of frozen sushi. With shrimp. I'm admittedly nervous about this one as far as taste in concerned. 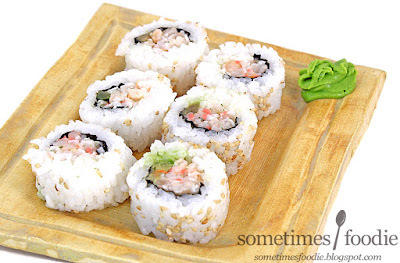 This is that sweet American grocery-store-style sushi that's pretty on-par with what you can buy at Trader Joe's. 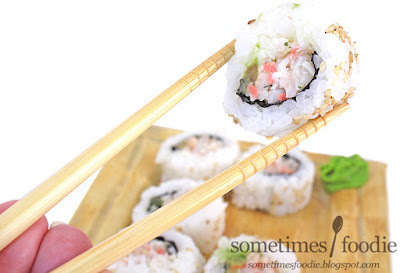 It lacks texture, freshness, and pretty much all the things that make real sushi appealing. Plus it's crazy sweet for some reason. I followed the same exact thawing instructions as I did last time, but the rice was a lot mushier and glue-like this time around. When you mix that with the mushy avocado and shrimp-salad-ish filling, it's just not good. I'm a huge cheapskate, and I hate wasting food, so I tried everything to make this more tolerable. 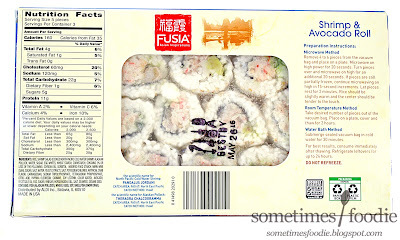 It comes with a packet of soy sauce and wasabi, so I tried adding those, but that didn't help. Both options were just too extreme when mixed with the overall sweetness, and the mushiness got worse when wet. It's not the worse "sushi" I've ever had, and it didn't make me sick, but I just couldn't get myself to eat it all. Last time I finished the California rolls without a problem, but this time I could only get myself to eat/experiment with 12 rolls before giving up, and tossing the last three into the trash. I REALLY hate wasting food (and money) so for e to give up entirely and actually throw something edible away, is quite telling. I wonder if Aldi's has same return policy as TJ"s? If you bring in opened products and no receipt?